Goya’s interest in the eye was, of course, natural for an artist but few painters have based quite so many images on ocular shapes, often suggesting with bright light outside that the scene itself takes place behind his eye and, thus, in his mind. 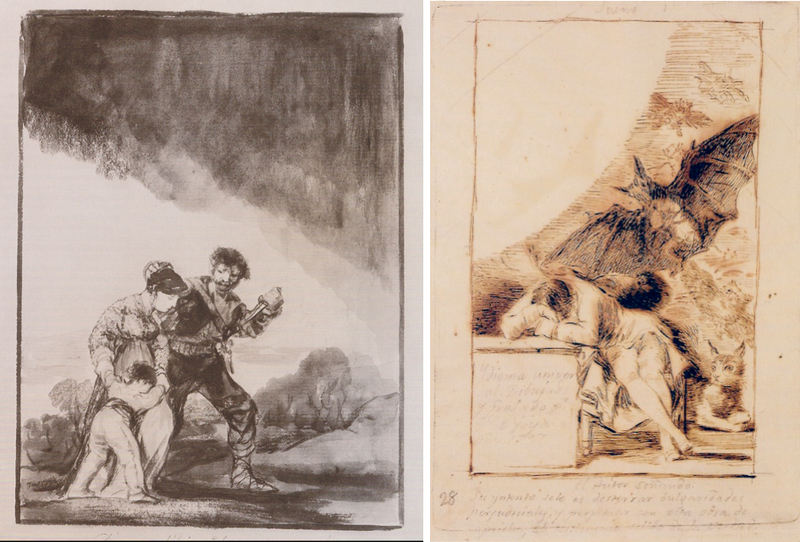 It has already been shown here that at least four of Goya’s etchings from The Disasters of War take place in the same fashion behind his “eye”. Here we will show how he used the form of the eye for the same purpose elsewhere and in a number of different ways throughout his career. As far as we know, none of these has ever been identified as such before. 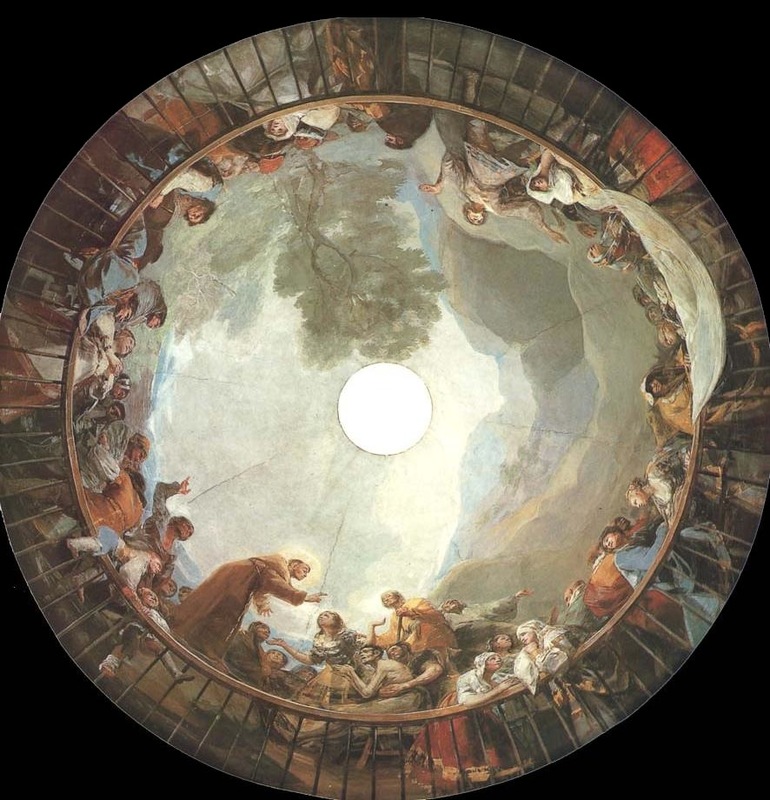 One painting unquestionably suggests an eye, the fresco Goya completed in the dome of a Madrid church in 1798. The space, which is even described architecturally as an oculus, is made more eye-like by the railing running around it. 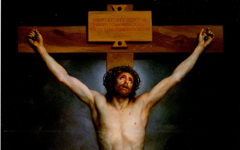 However, instead of filling the space with heavenly figures, as was conventional, Goya placed ordinary people there, some watching the miracle taking place at the bottom edge of the circle, others looking elsewhere. Heaven, Goya is saying, is not the abode of divine beings in the sky but behind our own eyes and in our minds. A late drawing called Comical Discovery (1824) is shaped like an eye as well, though it appears more animal than human (left). A number of grimacing faces are crammed into it with lines extending from its upper edge resembling eyelashes. 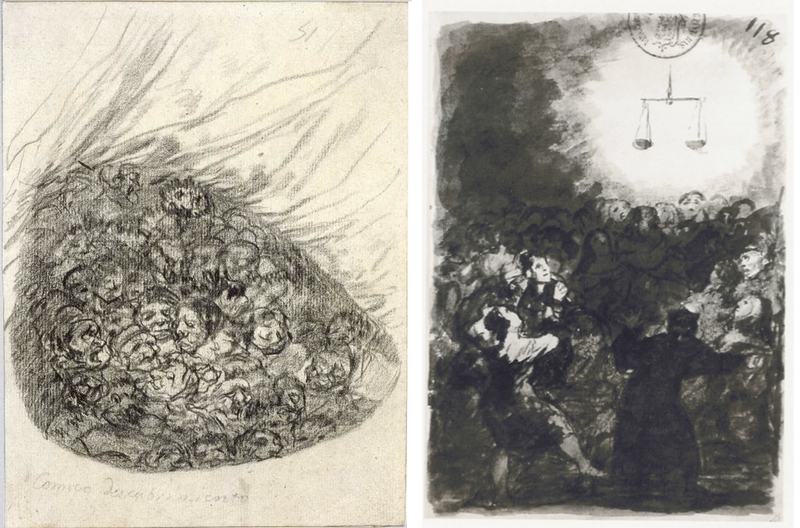 In a second drawing, The Coming of Justice, the figures are lit by a circular vision which is really, on the underlying level, an eye with all the figures in Goya's darkened mind behind it, light streaming in from the outside. In the drawing at left the bright shape behind the couple is the corner of an eye seen, as usual, from the inside. And in a well-known frontispiece to a set of etchings titled Dreams, the empty circular shape again represents Goya's eye with a representation of the artist himself dreaming in despair behind it. A bullring is, of course, naturally circular but that did not stop Goya from using its shape to suggest an eye, as Picasso often did too. The sandy surface is, besides, so bright that it seems to shine back at us as though light is passing through it. 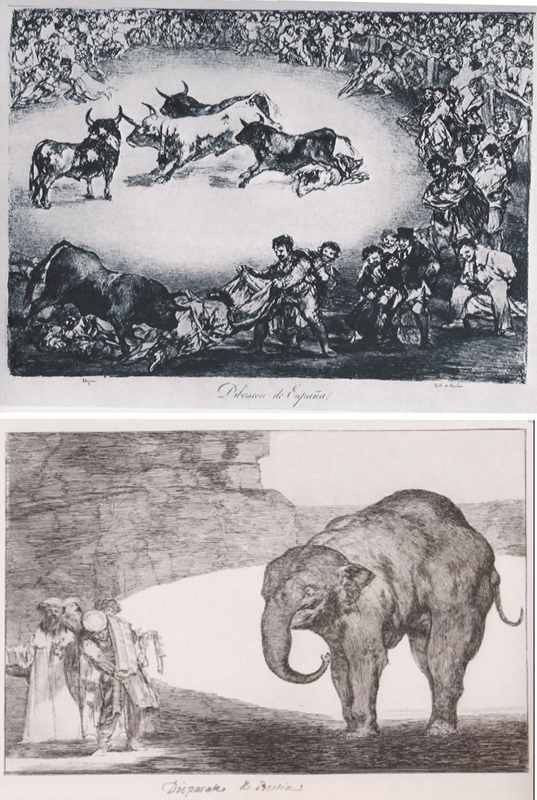 In the other image, a similarly bright circular ground shines with light behind the elephant thus suggesting, as usual, that the action is taking place on the inside of Goya's eye. 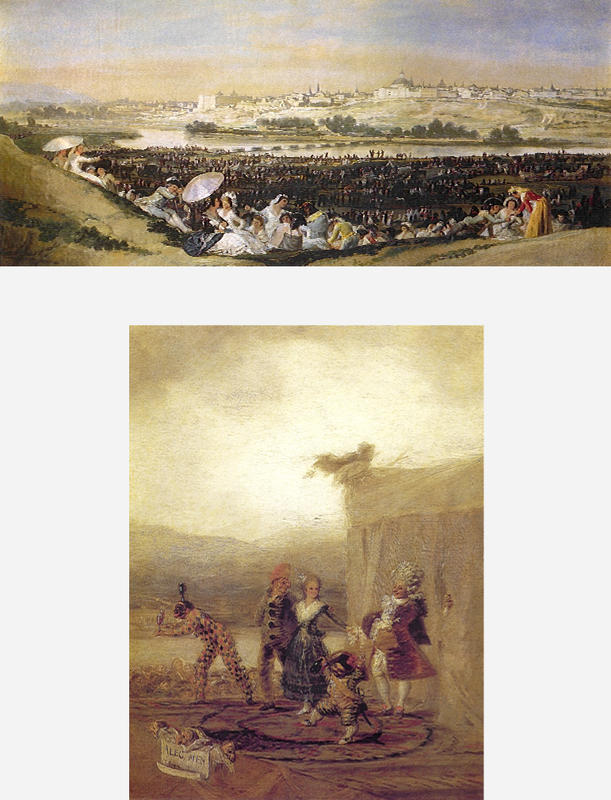 A different and more subtle example is The Meadows of San Isidro (top). The shapes of the land mass on either side of the river are formed like the upper and lower lids of a partly opened eye with the light-filled river as the narrow gap between the two. Similarly subtle, the bright clouds behind the Strolling Players (bottom), though ill-defined and amorphous, are eye-shaped too with light filtering in from the exterior world. 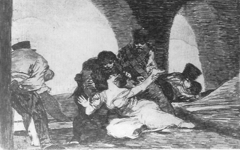 The images here, and those in The Disasters of War series, should give an idea of how Goya constructed one of his standard underlying scenes: light in the background shines in through an eye-shaped form in order to convey the idea that the figures in our foreground are behind Goya's eye (or eyes). Thus, the true scene, as always, is in his mind. Don't be fooled by scenes of war. They are inside, not outside. Original Publication Date on EPPH: 04 Dec 2010. © Simon Abrahams. Articles on this site are the copyright of Simon Abrahams. To use copyrighted material in print or other media for purposes beyond 'fair use', you must obtain permission from the copyright owner. Websites may link to this page without permission (please do) but may not reproduce the material on their own site without crediting Simon Abrahams and EPPH.